Hotel great though looking a bit tired could do with a general update. had a fantastic apartment on 22nd floor great views only problem was lack of water for showers etc problem with the plumbing on this floor. we were moved to another apartment with no problem not as spacious on 18th floor but water pressure great.No complaints with the food always hot and good variety.The only downside to this hotel was the entertainment but may have been downsized due to time of year. local bus cost 1.20 euro regular service plus also a free bus to the other hotels which you could use with your all inclusive card. we have just getting back home after a 2 week holiday at the Monika holidays we found the room clean apart from the windows were dirty there was dirty marks on the walls apart from that it was fine. food was nice sometimes a little cold but there was a microwave where you could warm your food back up not a good idea for the likes of meat etc. location was okay you could get a bus for 1 euro in to benidorm shopping area which only took 15 minutes or just take a bus anywhere for 1 euro, there was a beach 5 minutes away which is a lovely beach lots of cafes and restaurants a few shops. entertainment wasn't very good but a new entertainment manager was employed towards the end of our second week it was okay we often went to the crystal park which is in the group and their entertainment was brilliant. overall we had a good holiday we would visit again if the negative comments i have made were sorted out. Excellent service from day one. Rooms just right for family of four and yes with fully working air con. the kitchen area nice and compact but few wears tears.Plent of storage for cloths ect and safe avail in room but not free. All rooms facing a fab pool area with 2x jacuzzu, middle of pool bar and kids fun pool.All rooms cleaned daily. 24hr reception, crazy golf,large gym, 2xSqush courts and much much more for ages. Well just got back from the best holiday yet, I really don't know how this hotel have got so many bad reviews, the room was just great, very big with kitchen, dining area, living room area, with a separate bedroom, and the cleanliness was excellent, well the food was just lovely with full English breakfast and the rest of the day the food was really good with plenty of well cooked food to chose from. Also the snack bar was good as well, the hotel location was fantastic, with lovely walks, to the beach which is just down the road, we also caught the free bus into town, for a bit of shopping, and then went to 3 of the other hotels belonging to the chain, there are 12 in all and you can use them all if you want, so your all inclusive can be used in all the other hotels, which is just great if you are out and about as you don't need to use any of your own money, just pop in and order that drink and enjoy your food, cant fault it. The staff were really nice and none of them could not do enough for you, really friendly and helpful. The entertainment we could not fault and the acts that was put on were fab, we really had a laugh, we would visit this hotel again anytime and we would stay at any of the others as well. A very good time had by my husband and myself and we made some very good friends, it is also 24 hours all inclusive, so go and enjoy your-selves. We were a bit concerned about our stay after seeing some of the previous comments. Our room was kept very clean and the maids were always nice and efficient. This hotel looks so nice in the brochure and on the internet, it is not it is awful! My family stayed in what they call the penthouse suite ( what they class as penthouse suite is not at all what I call a penthouse suite ). The space in the suite was good but thats all that was. As far as the food goes my daughter ate out at Macdonalds and KFC most of the time. 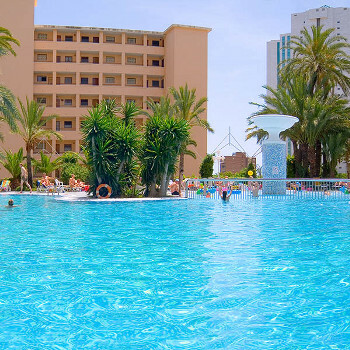 I have been to Benidorm 3 times now and I would definitely advise to stay in the Levante part of town, if you do prefer to stay up this part of town, stay in the Gran Bali Hotel I could not fault this hotel in any way at all. Levante is definitely best especially if you like a lively resort. Hi all stayed at this hotel with my wife for five weeks. We had a large and spotlessly clean apartmentthe towels were changed very day the sheets twice a week. The hotel its self while looking very tired was kept very clean and tidy. The food was a bad mark against the hotel, there was plenty of choice, but most of the food served was very badly presented and was often luke warm, we along with others at the hotel informed the restaurant manger, and while the was a slight improvement it should have been a lot better. The managers main reply was that the majority of the guests were Spanish and they did not mind the food being warm as they were use to it that way. The hotel staff in the bars and dining rooms were great and always with a nice welcoming smile. The entertainment at the hotel at night time was very poor and some of it was cancelled without informing the guests they the guests were left waiting for no show, the day time entertainment for adults was fantastic, the two young ladies who ran it (Eva and Funar) could not do enough to please and they were only students. There was hardly any entertainment for childen, it seemed only when there was a lot of Spanish children there was any thing done. john-doe. This is my honest opinion of this hotel. We stayed at the Monika for 2wks. The hotel is big and airy. The staff were the best we have met in Spain. Monika is quite a distants from the centre of Benidorm but as we found out the bus service is excellent just costing 1 euro each way(about 70p)and very frequant all through the day and night. The food wasnt good and the deserts were the same day after day,which led to complaints and things did start to improve near the end of your stay. From the hotel there is a 5min walk to Finestart beach wich has some British bars and shops. The hotel has a bus stop right out side which can take you to Terra Mitica theme park, if you intend going to any of the parks in beni buy you tickets from the reps as thay work out a lot cheaper. The swimming pool is the main feature of the hotel the kids will love it. Entertaiment was mainly for the Spanish but things might be different in the summer months. We would deffently go back. If you stay 2wks all in you can go to the medieval night for free which was a very good night. The hotel has a free bus serice that runs between the hotels but can take a will to get to places so the local buses are better. We stayed in the Monika for a weeks all inclusive. On arrival we went to our room which was very impressive (a 3 bed apartment for 2 of us haha)quite clean except for the balcony which still had dirty glasses on and cig packets cleaned it up no probs. We then went downstairs for a drink and a look round the staff not friendly. The next day we checked it out went in the dining room well what a disaster my husbands not a fussy eater but he even wouldnt eat what was on offer it seemed to be overrun with Spanish people and Spanish food. The chips were cold, tried the salad and the tomatoes were soggy. We then went and got some drinks to check the entertainment out and what do you know kids disco Spanish music even the English kids were being left out. The staff were very ignorant except for 1 or 2 no smiles no interaction except with yes the spanish there must have been 80 percent Spanish. The best part of the hotel was the room only because we were lucky. They had computers and pool tables but I thought they was a bit expensive 2 euro for a game of pool and 1 euro for 20 mins on pc. If your taking kids take your wallet and eat out because you won't eat that rubbish. One guest said the week before the food was nice so unless they move chefs around I don;t know, we even tried two more magic hotels and the food was not nice there I think if they taught the staff manners and how to cook it would be a top hotel. We stayed at the Monika Aug 15th to 29th. Our room was never cleaned during our stay although clean towels were left daily. The food was cold most of the time, sunbeds chained up till 9am so you were up at 7am to find your spot to place your towels and then waited till 9 when people would become aggressive trying to get a sunbed and were constantly pushed and elbowed out of the way. Mice and cockroaches were seen in the dining room. Queues at the bars during the evening was the normal and the holiday reps were never there at the times stated. Many of the staff were unfriendly.